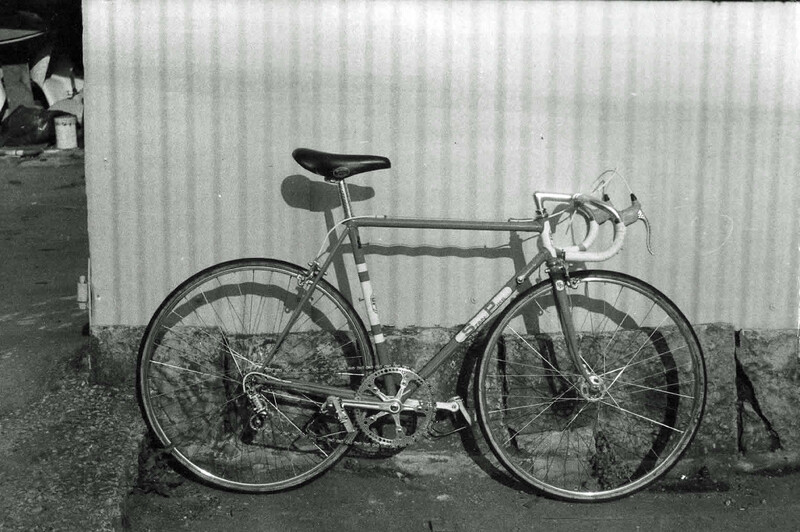 Malcolm Howell sent me photos of the bicycle that was made fork him by Stan in 1981. 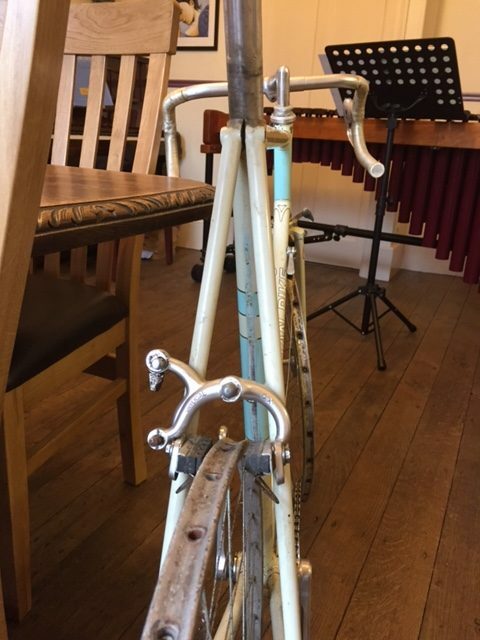 It was originally fitted with drops, but it currently has straight bars. 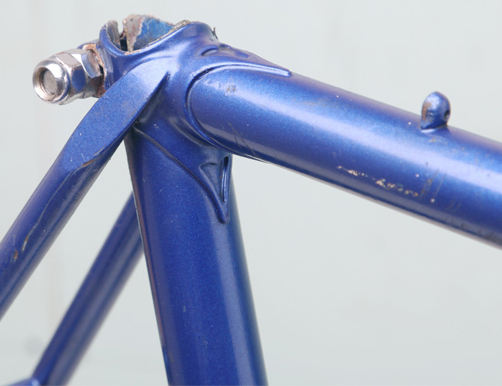 The colour is original and the frame size is 24 1/2″. He still has the build sheet. 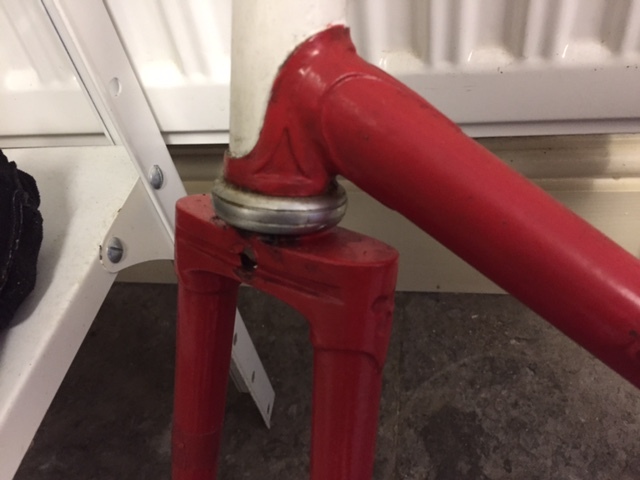 Malcolm says the bottom bracket was reamed out and a steel sleeve fitted, and re-threaded by Argos of Bristol in 2004. 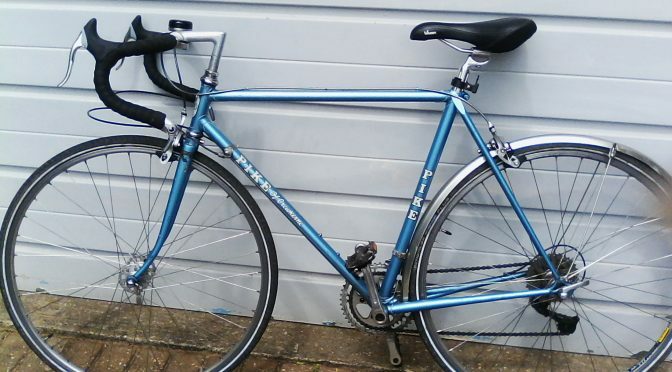 Malcolm has stopped riding and is looking to sell the bike. 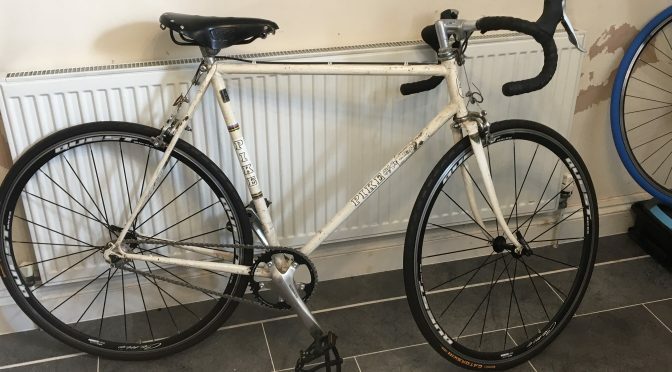 He’s looking for around £600. 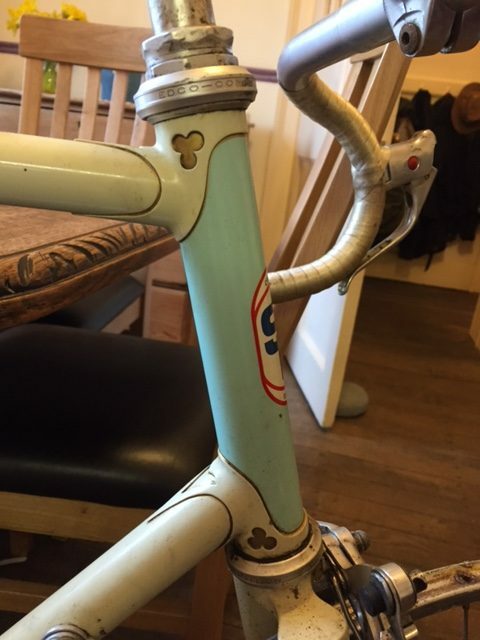 Stan’s frames are becoming increasingly difficult to get hold of, so grab one while you can. If you’re interested, or would like more information, please contact me. 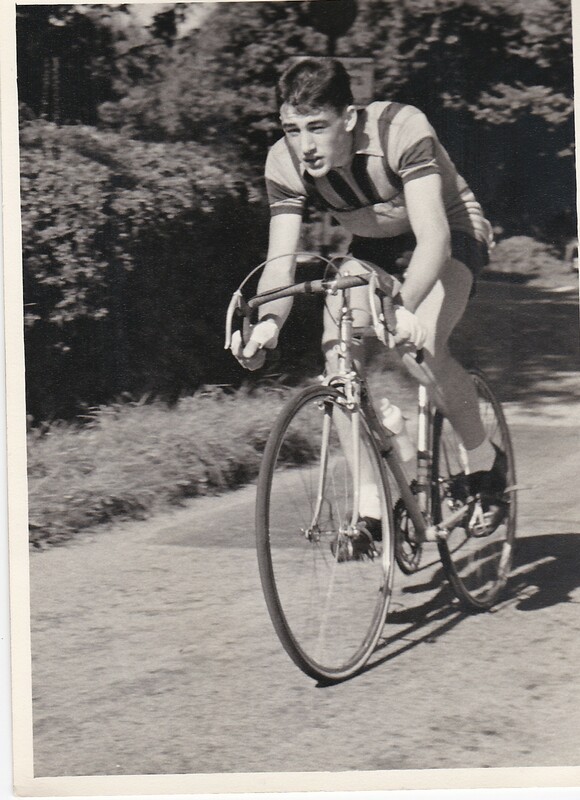 I attach four photos from 1958, when I was 17 years old and riding for the Edgware RC. 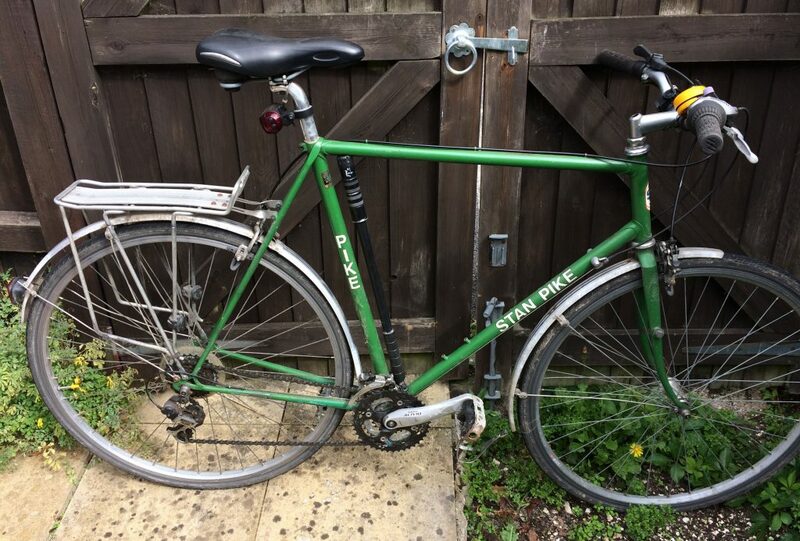 The bike I am riding is a Wally Green that I bought secondhand from Don Farrell for £25. I borrowed the money from my mum and paid it back weekly! 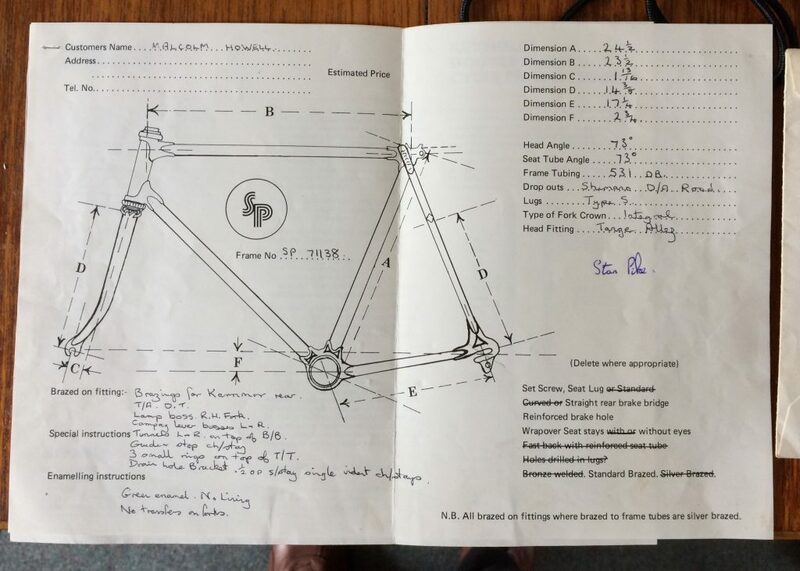 The frame number was P1 and I was told (I’m pretty sure I was told by Harold Peters, whom we knew as Pete, who was Wally’s frame builder in the late fifties and ran the shop in Hendon Central) that it was Stan’s first frame for Wally. 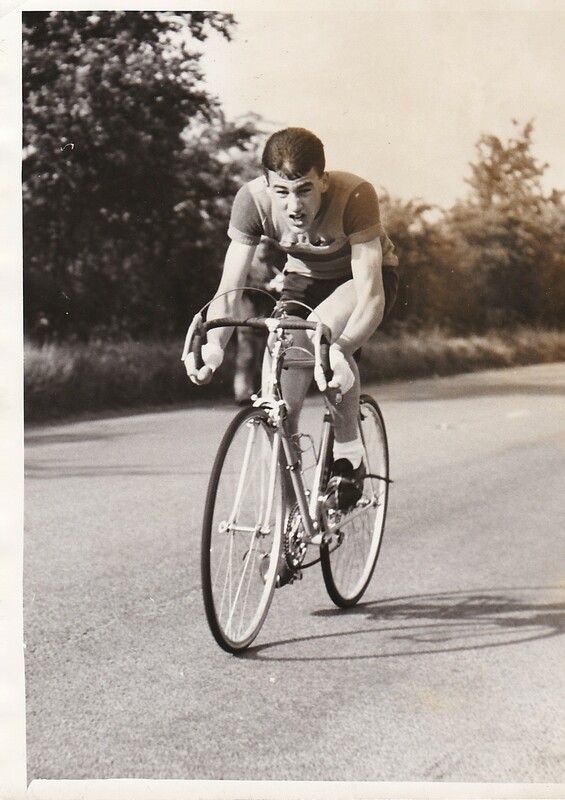 I was West London Junior Champion in 1959 and went on to ride as an Independent (Semi- Pro) for Wally Green/ Cafe den Engel Gent, in the early sixties. 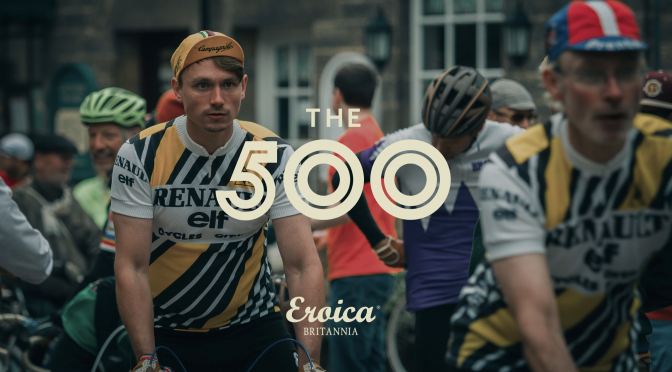 Proud to have ridden a small part of cycling history. Unfortunately, I gave the frame away and it is now lost. 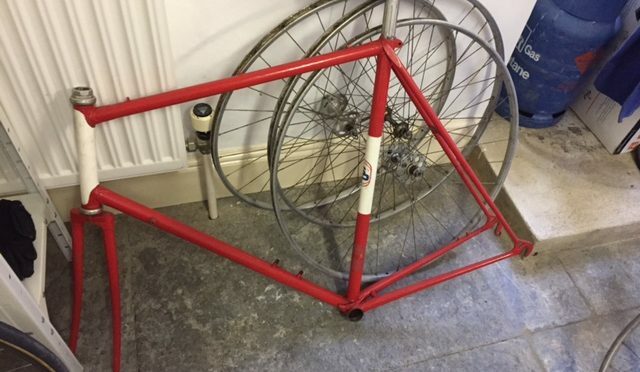 Does anyone know the whereabouts of John’s frame? It’d be great to track it down and add it to the website. 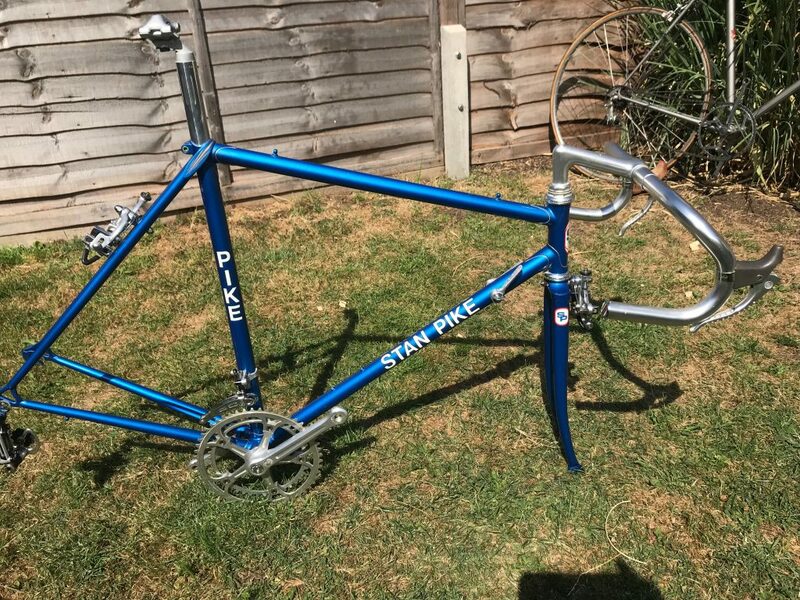 I have a Stan Pike frame K77069R, sold to me by John Woodburn, a dear friend of mine, who stayed with me before and after his End to End ride. He told me that he had won the BBAR on it. I am interested to know it’s posssible current value for insurance purposes. 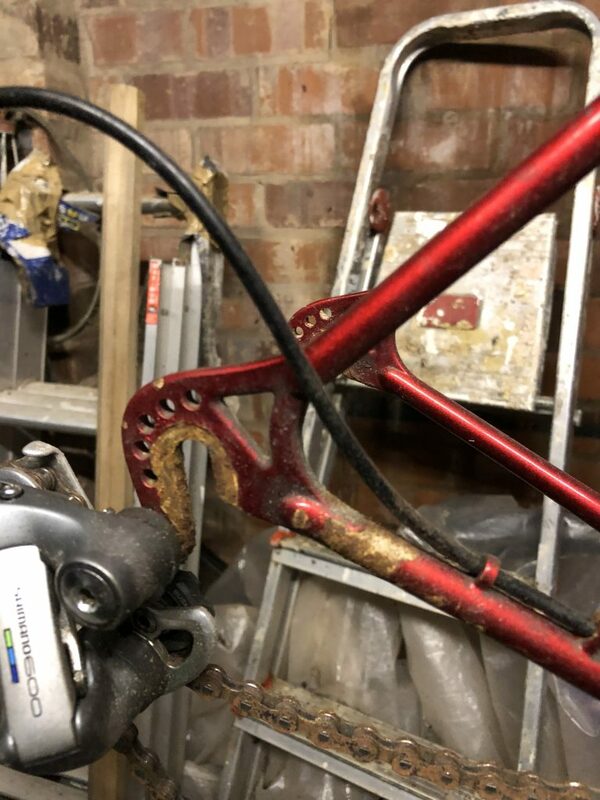 Thanks for getting in touch regarding the frame. It’d be great to have some photos so we could pop the frame onto the website. Would you be interested in that? I can forward them to Stan’s son to see if he has any further information. 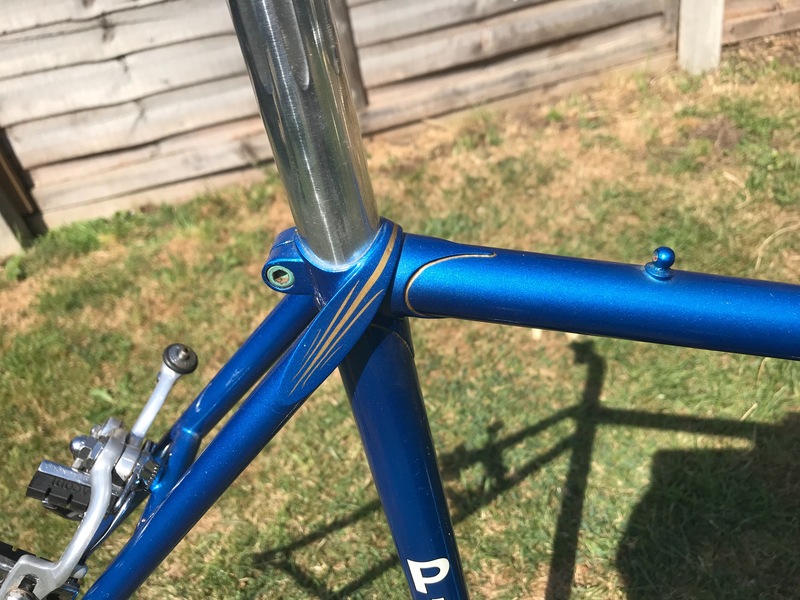 I’m afraid that prices are still very low compared to how much people are willing to pay for a modern carbon frame. Regarding the value, it’s almost impossible to put a price on it. 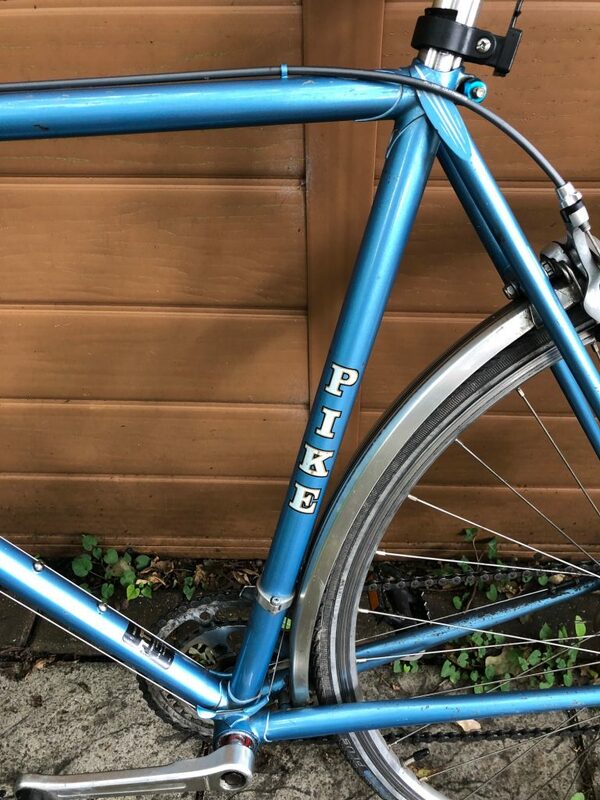 Recent ebay sales for Pikes have ranged from around £200 to £600. 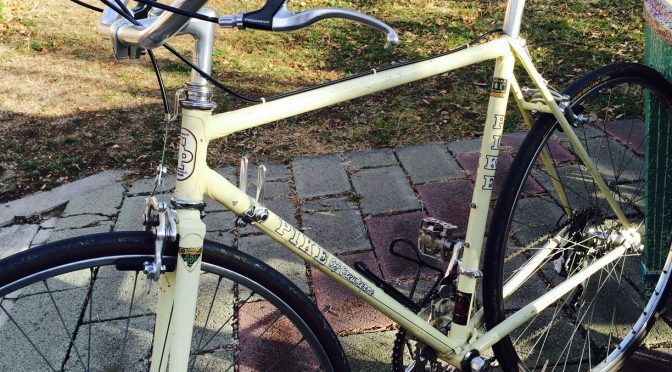 It really depends on who is looking to buy a bike at a particular time. Sorry, I realise that’s not very helpful. 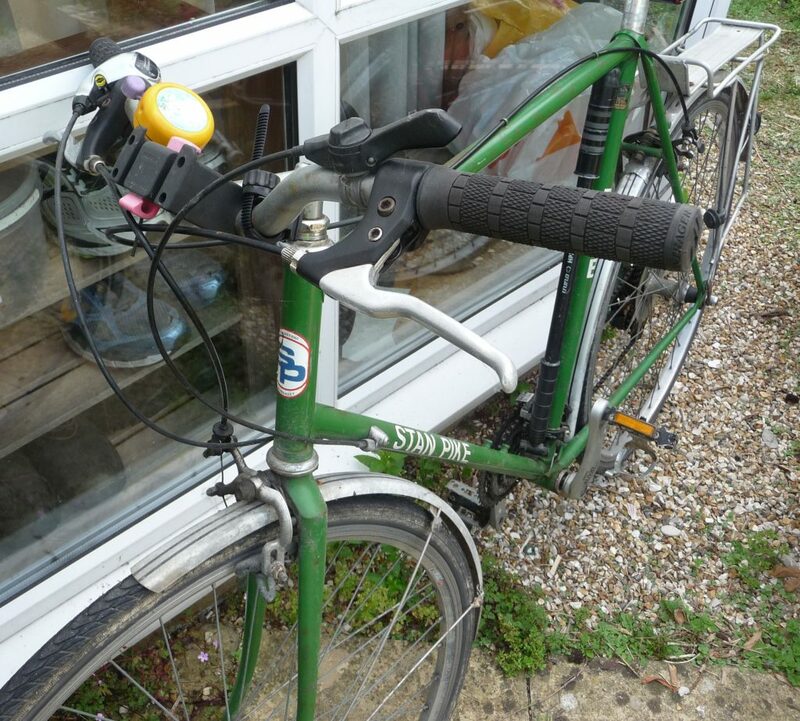 I recently attended a cycle jumble at Ripley in Surrey. 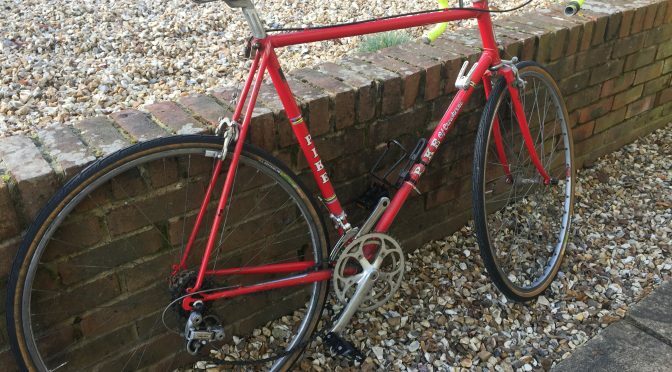 Two ladies and a gentleman were selling bike parts, photographs and medals from the late John Woodburn’s estate (long story). 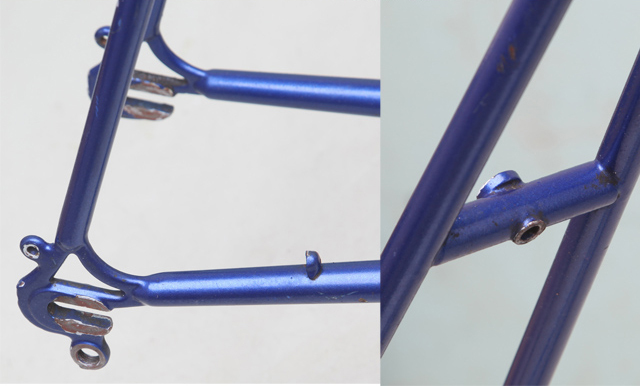 Turns out the parts were from one of JWs Stan Pike Machines (K77069R). 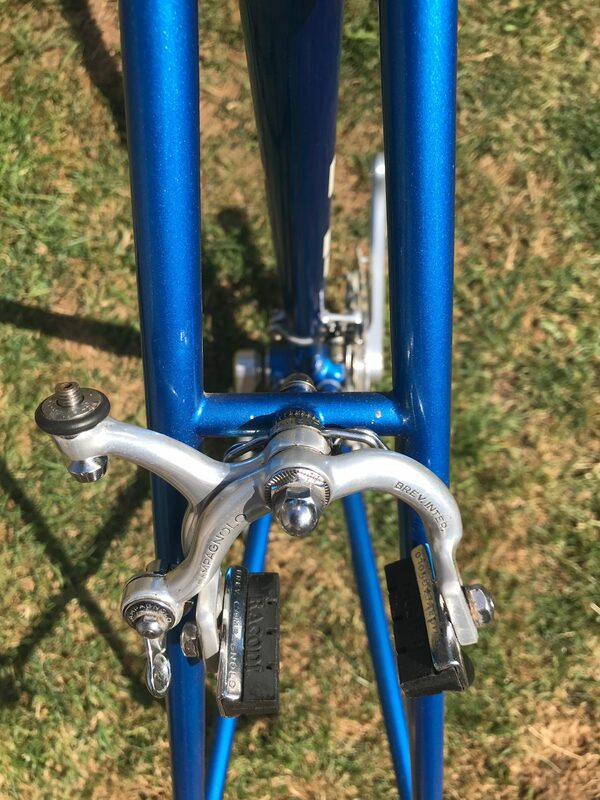 Asking where the frame was, I was told “it was at home” and they had taken the parts off the day before as it was easier than bringing the whole bike. You can imagine how I felt. 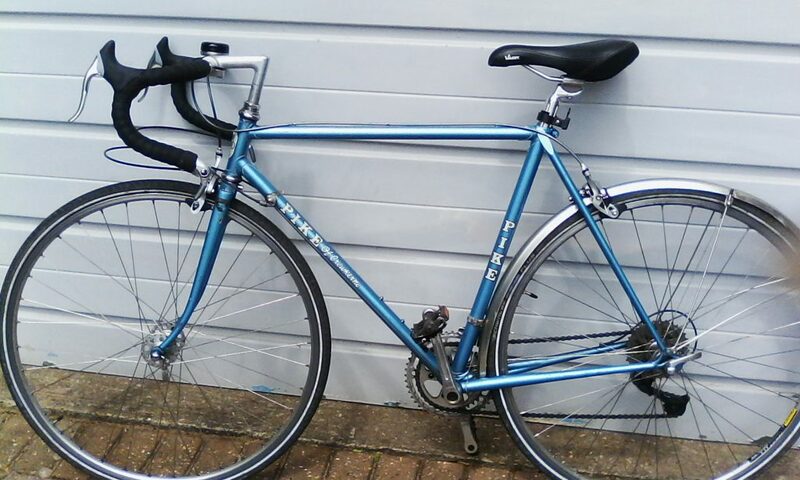 So next day saw me back in Surrey where I was able to buy the frame. 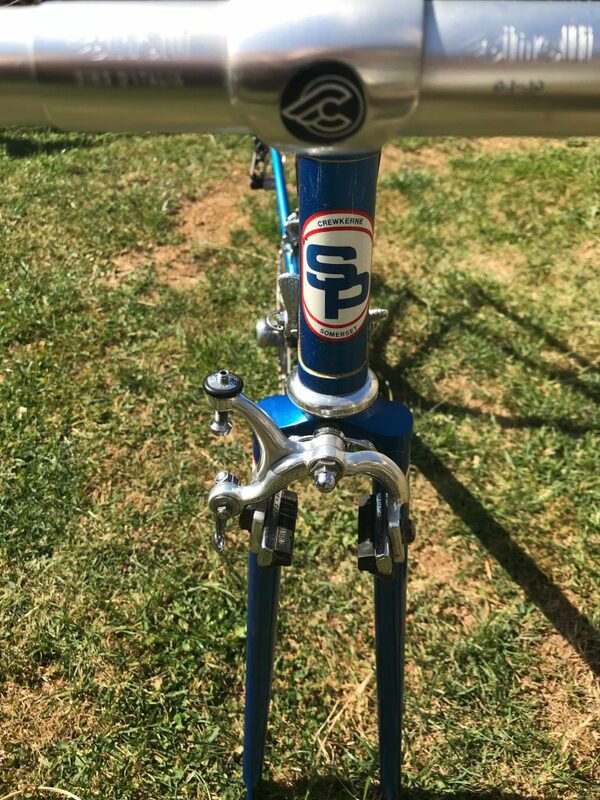 To my relief there were still some components mounted on the frame – seat post, B/B, cranks, headset, bars and stem & brake levers – all Campagnolo Super Record. 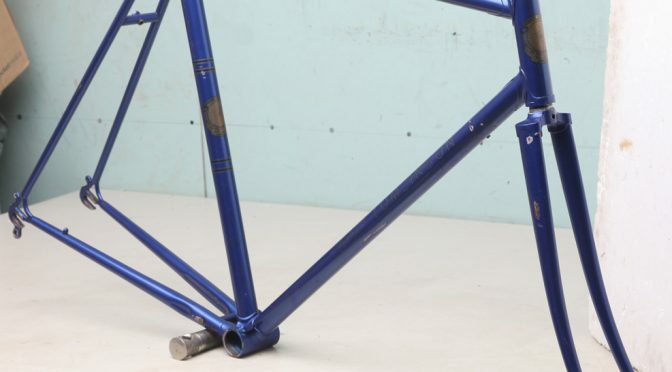 The frame carries the initials KR and so was built for Ken Ryall Cycles not directly for John Woodburn. 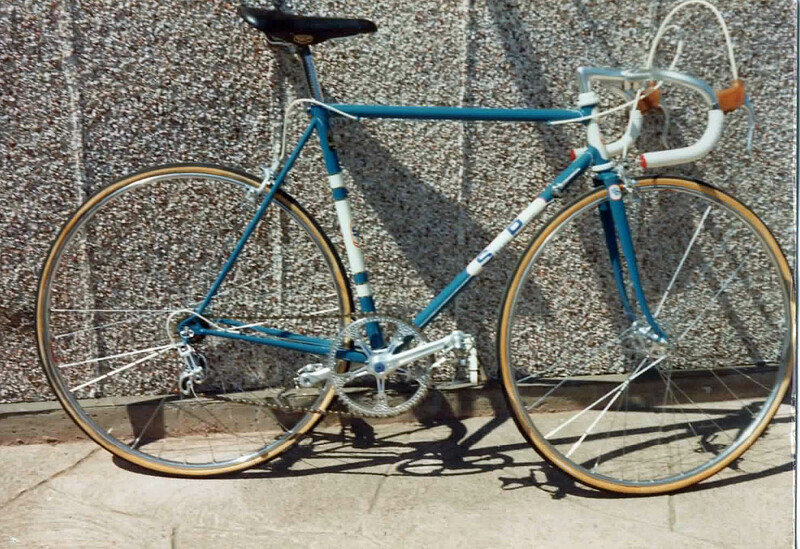 Although it is painted the same colour, this Ken Ryall frame was not the one used for the End-to-End. Please see the John Woodburn page for details (scroll to the bottom). I first met John Woodburn and his partner Anne, at the Charlotteville CC Easter 50 in 1980. 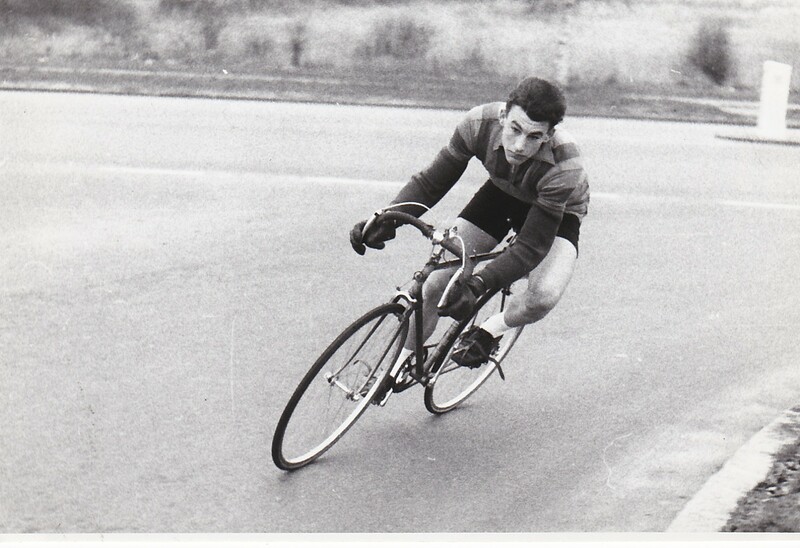 (I was a member of the Charlotteville CC). 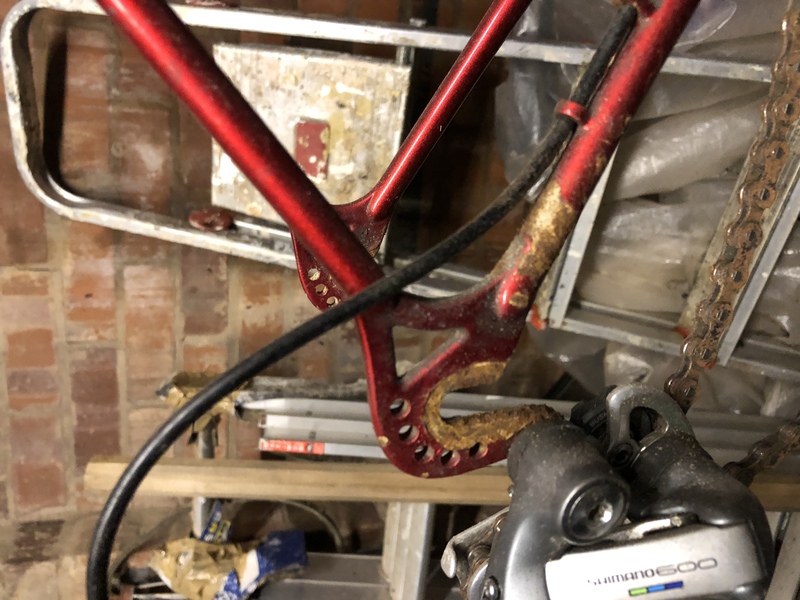 A couple of months later he when he found himself “between properties” he asked if I had a spare room that he could stay in and indoor accommodation for his bikes. So he moved into my house in Chilworth, near Guildford, for around 2 1/2-3 years. 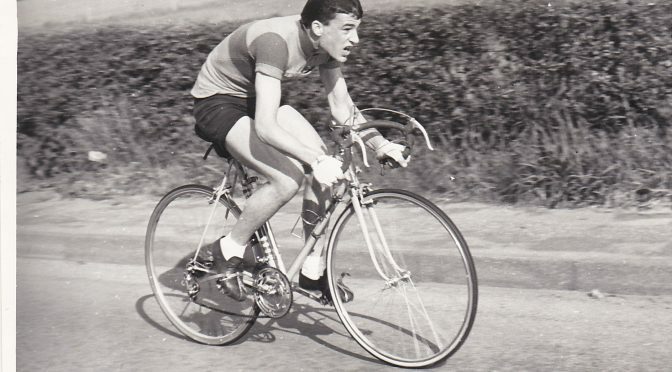 John worked as a Post Office engineer based in Windsor, and he rode to and from work every day a round trip of approx 50 miles. 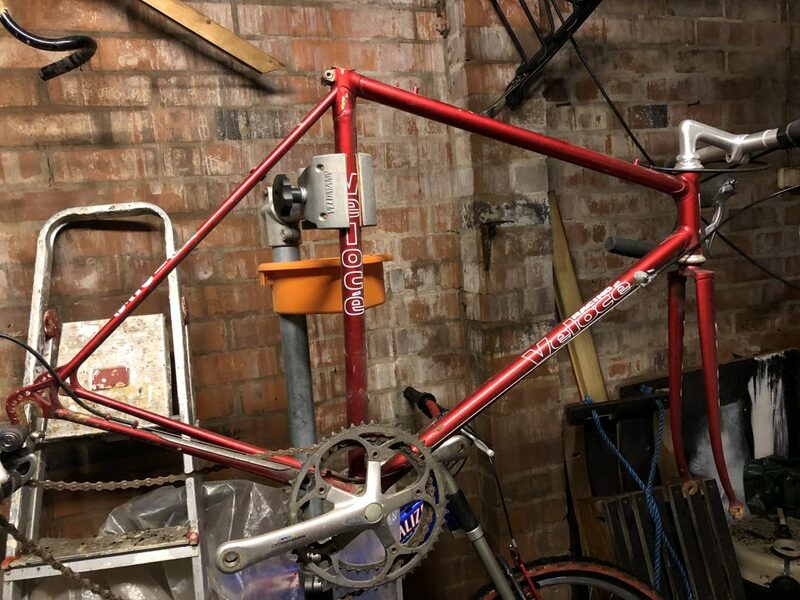 He did this through the winter of 1980/81 plus weekend rides as part of his preparation for the End-to-End (not on a Stan Pike but a winter hack bike). 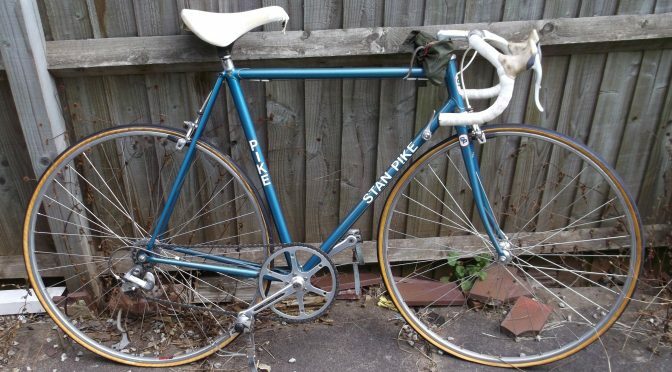 The Stan Pike lived in my hallway when he was not using it for racing. 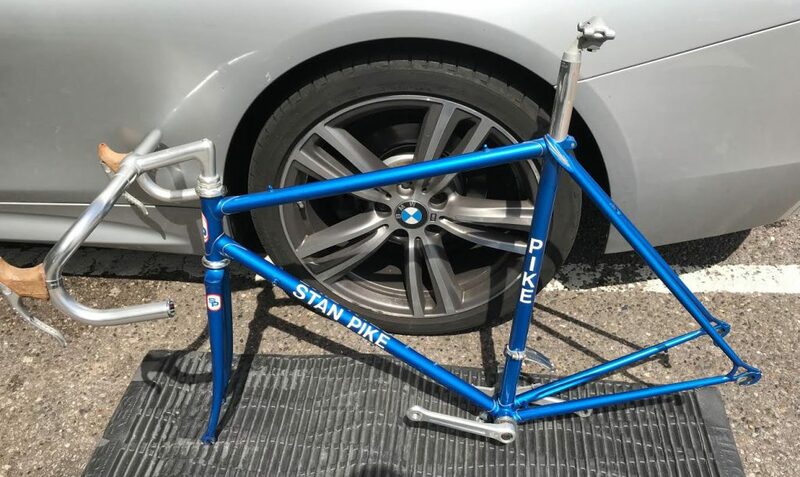 Shortly after his successful End-to-End ride, he offered to sell the Stan Pike frame to me having had it resprayed by Stan in the meantime. I duly bought it and it has been in various spare bedrooms ever since. 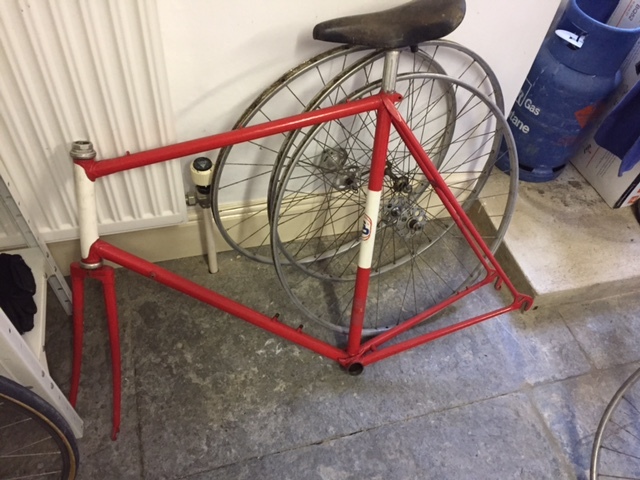 I had not intended to sell it but at a Cycle jumble in Ripley near Guildford, where I was helping with selling some of Johns”stuff”. 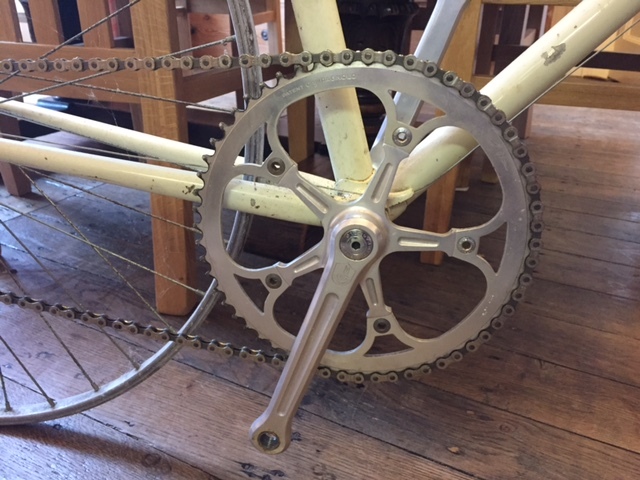 I mentioned to Mr Norgate about the frame and its history, he said that he was a collector and was interested, and asked if he could come to my home the next day to see it, and duly bought it from me. 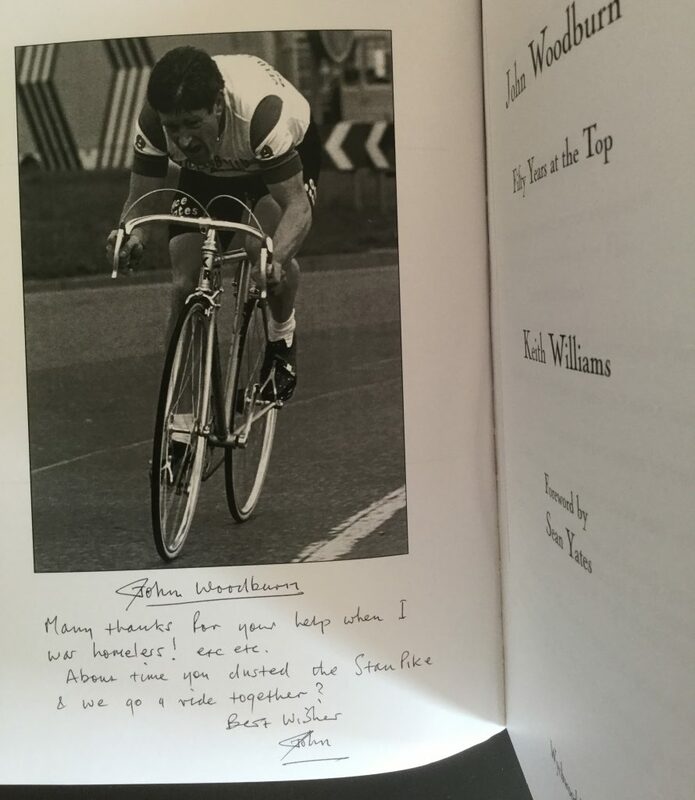 I am sending photos of a dedication by John from his book “50 Years at the Top” mentioning the Stan Pike. Also a postcard sent to me from John whilst he was riding the End-to-End route prior to the big event. I asked many times for him to write a provenance, he always said he would, but unfortunately, he never got around to it. I hope that this might be of use to you to confirm that the frame had indeed belonged to John. 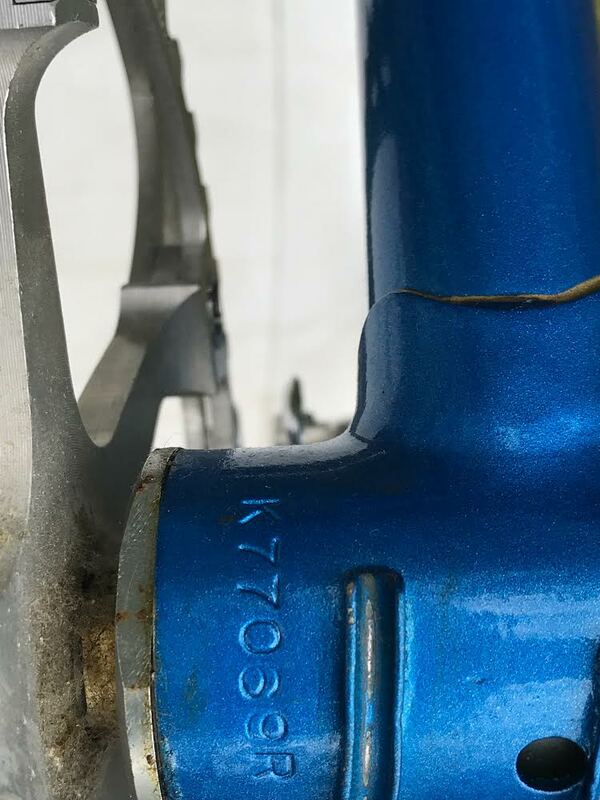 So it looks likely that John got this frame from Ken Ryall (some sort of sponsorship?) 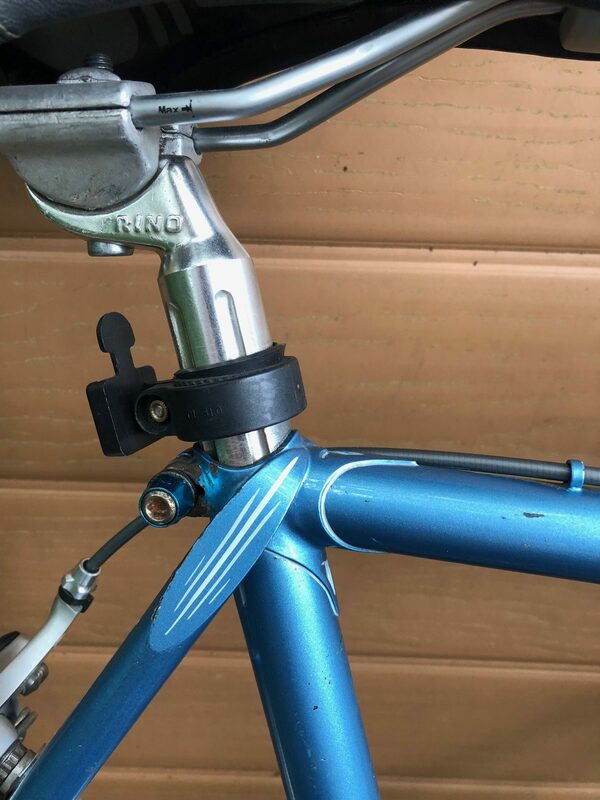 and used it for racing. There are a few photos of John on a Ryall frame on the internet. 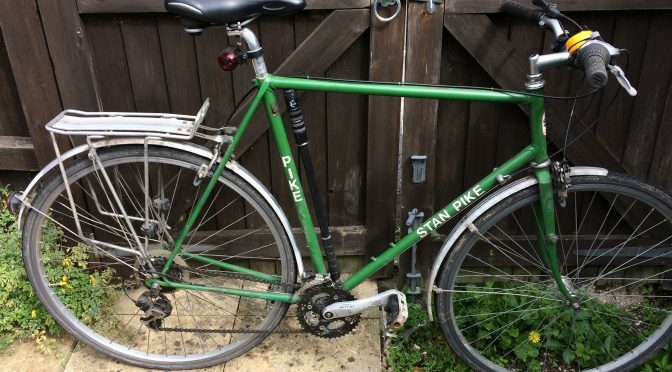 He then had it resprayed by Stan, as a Stan Pike, and later sold it to John Chitty. 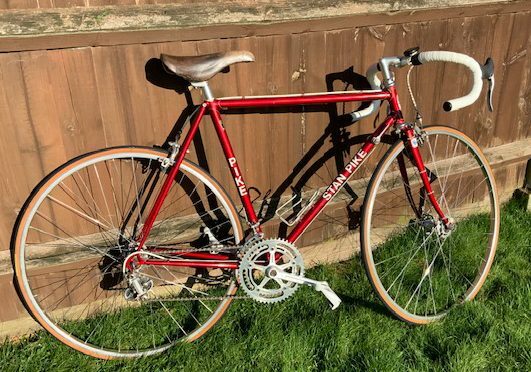 I am the owner of a Stan Pike road bike – frame no. SA 17. 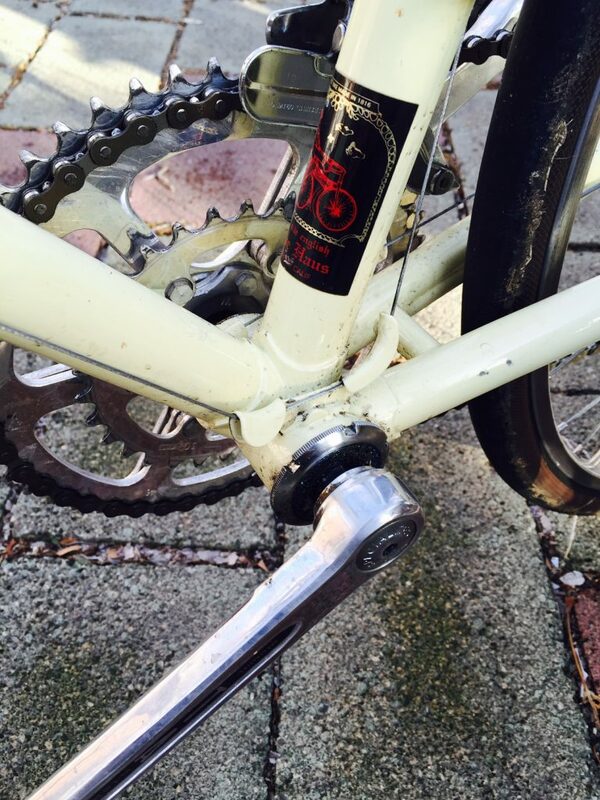 I am in my 70s now and find that I am no longer comfortable using it on longer rides. 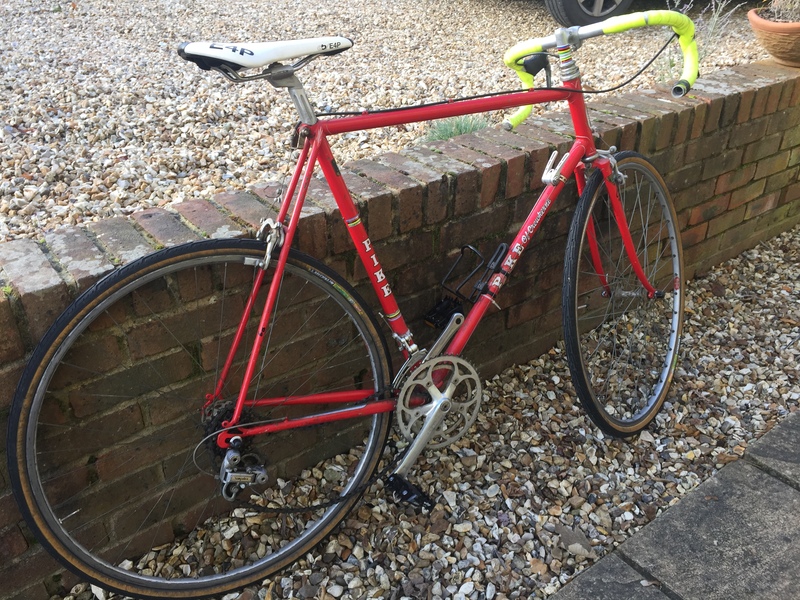 For that reason I am looking to sell it to a discerning individual with an interest in classic road bikes. 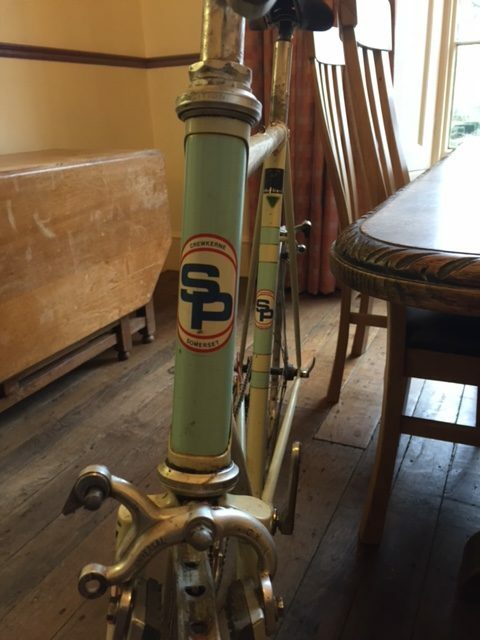 The bike does have sentimental value as my father was born and bred in Crewkerne. 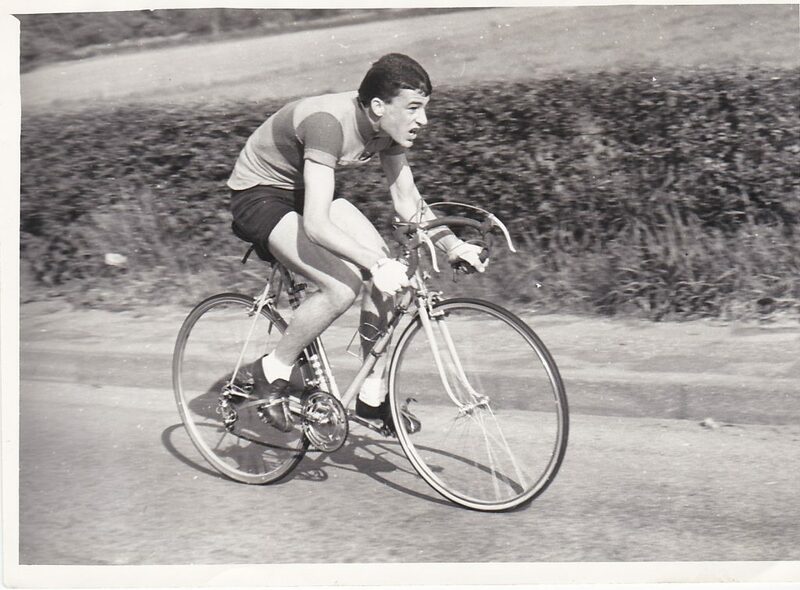 Although I have no personal knowledge of Stan Pike or his family, I suspect one or more of my uncles (now deceased) would have known him as a work colleague at Westlands. 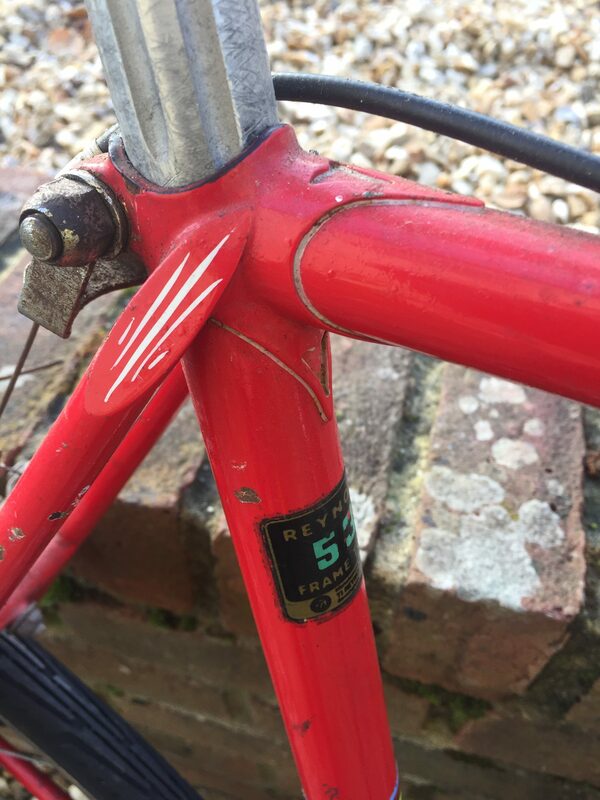 The bike is equipped with Reynolds 531 frame tubing and Zeus 2000 forks and is in roadworthy condition, with new marathon plus tyres. I can supply a photo and further details on request. 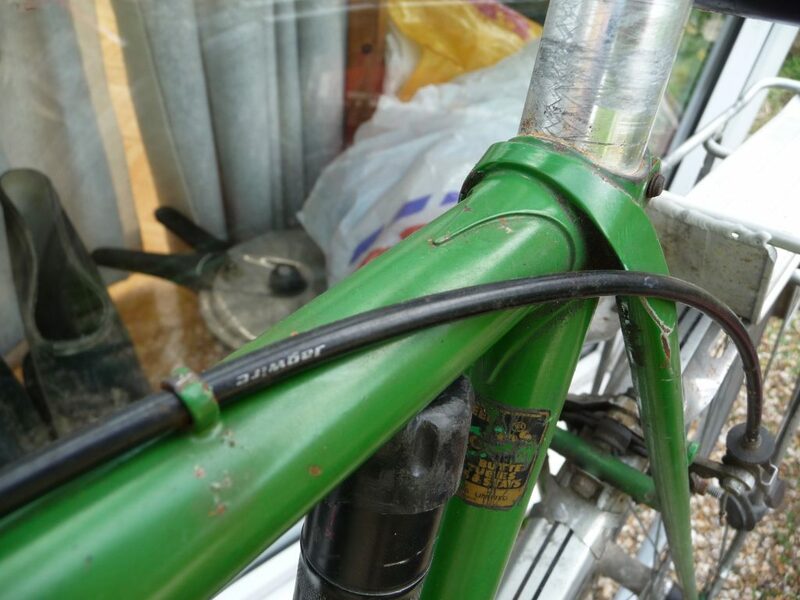 Perhaps I should say that I am not the original owner – I bought the bike about 16 years ago from a colleague. 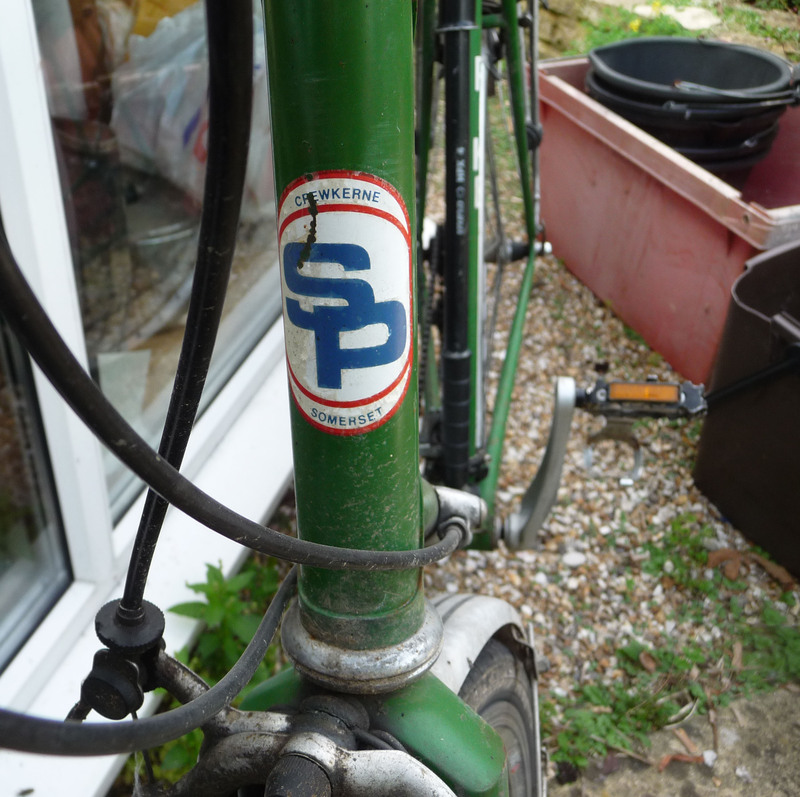 There is a logo on the bike which suggests that it may have been initially purchased from CT Haines & Son, Stonehenge Cycle Works, 8-10 Water Lane, Salisbury. 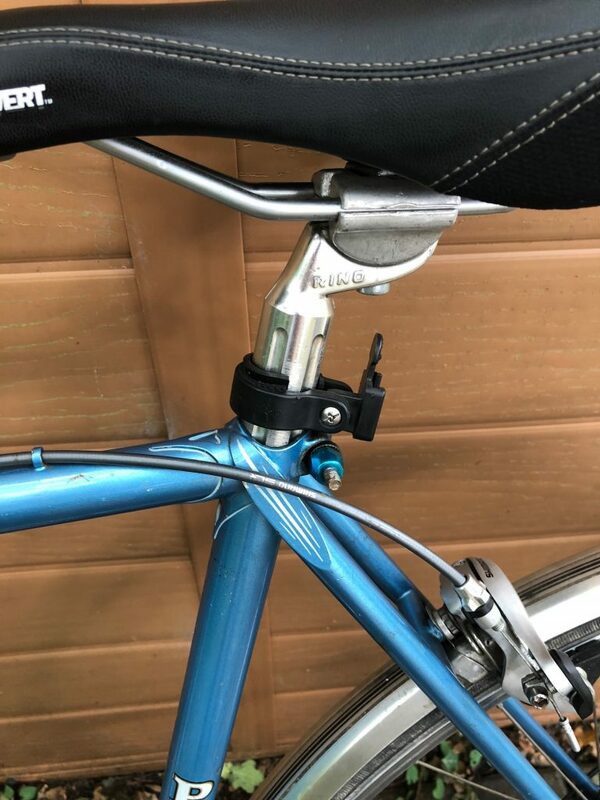 I had certain components ‘upgraded’ in 2014 prior to a cycling trip to France (new quick release wheels, bar end shifters, caliper brakes). 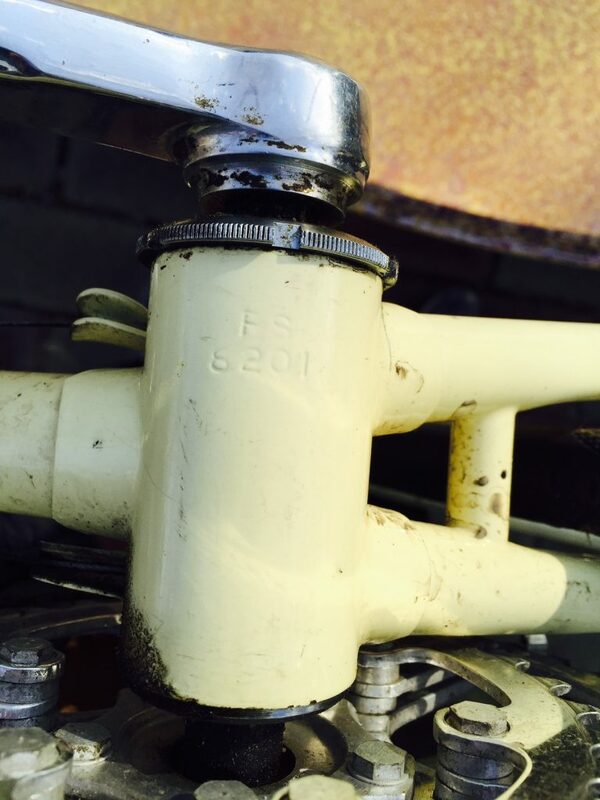 The bike has not been used much since then. 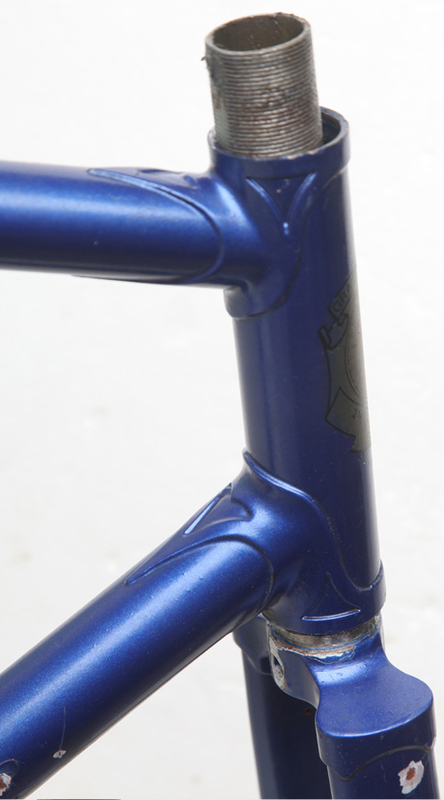 Frame size is 21.5” (54 cm). Wheels are 700 cc. 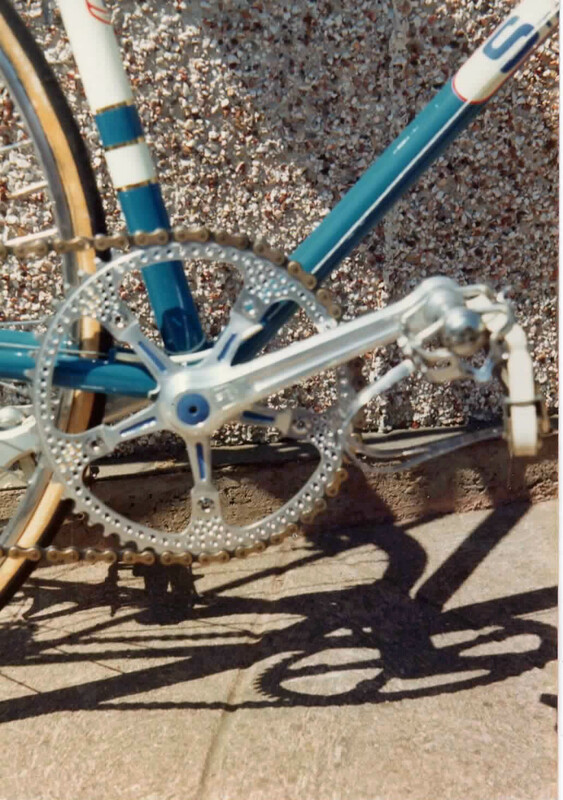 The chain set configuration is 48, 36. I am in Reno, Nevada, US. 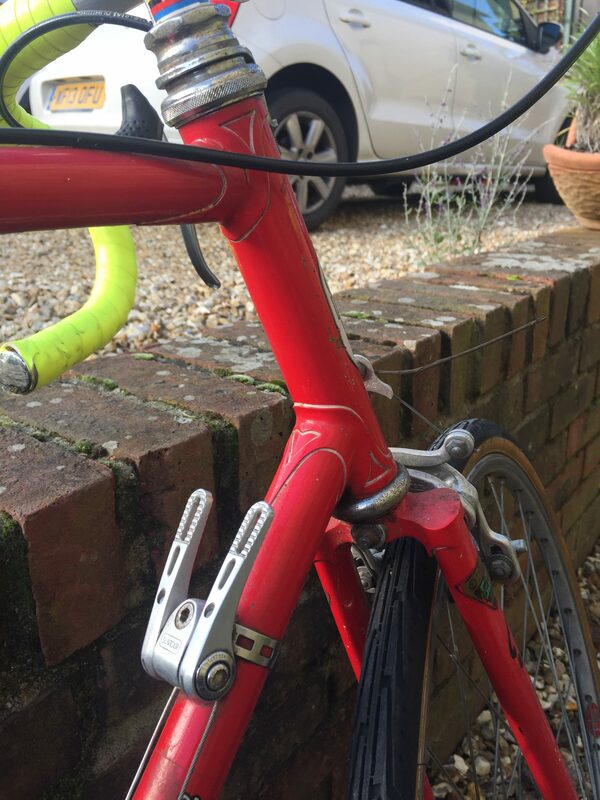 As an old time rider I lucked into this Pike of Crewmerne and was excited with the beautiful long point lugs and mix of Huret, TA, Mafac and Campagnolo build. 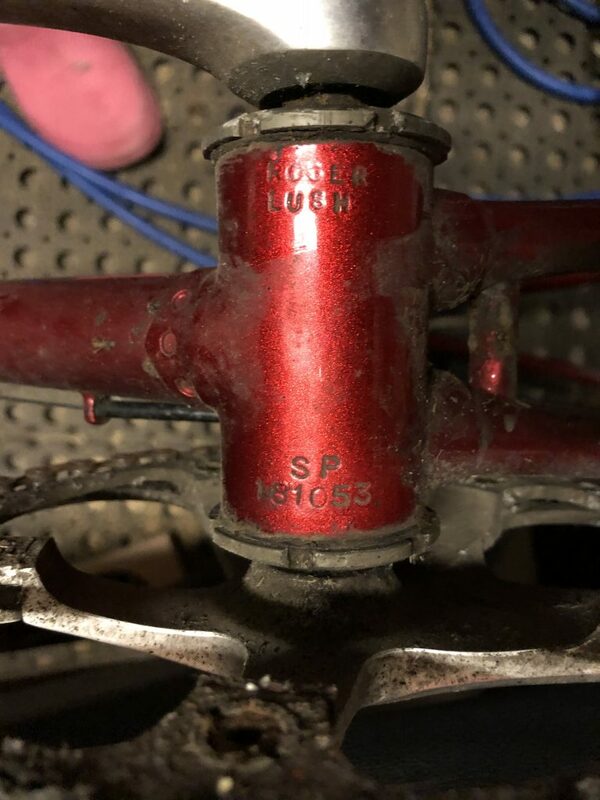 The frame number looks to be PS 8201. Built of straight gauge 531. Painted soft pale yellow. 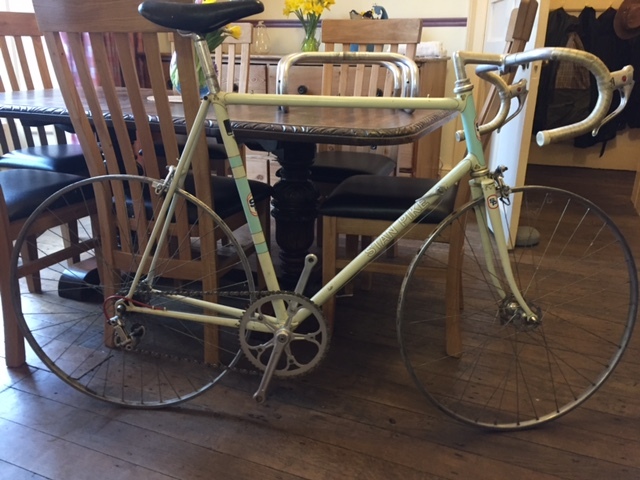 In great no rust condition and my size of 56cm or so. 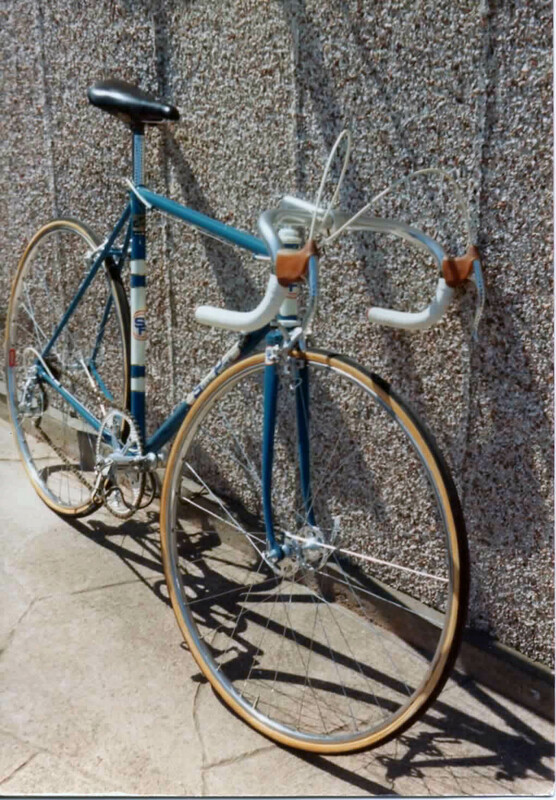 Very pretty bike and I would love to know the build year. 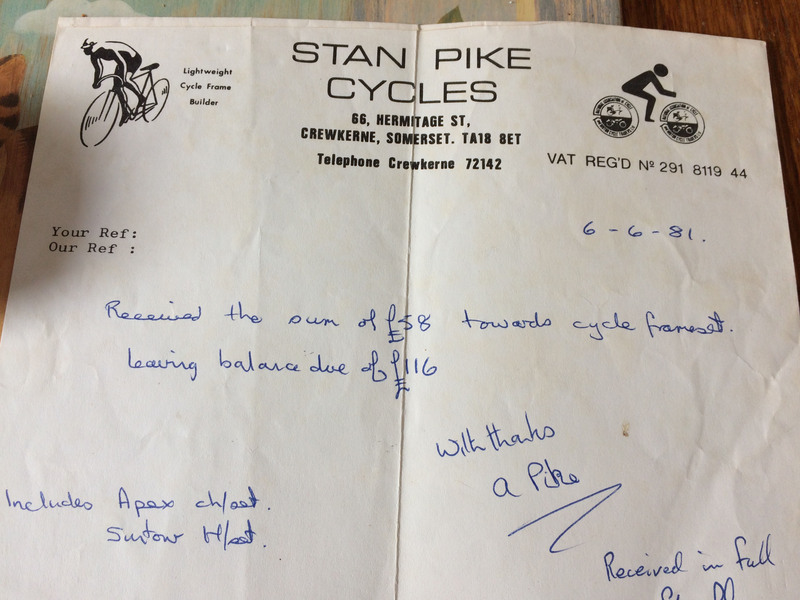 I saw this Stan Pike hanging on the wall of a local bike shop about a year ago now. 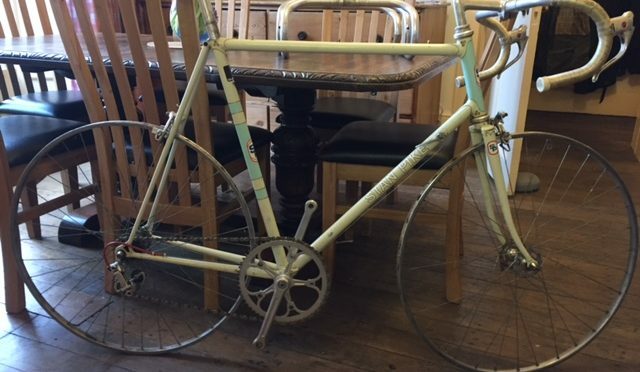 I asked about it and found it for sale. I took it home for the $300 U.S. and then made a few changes. 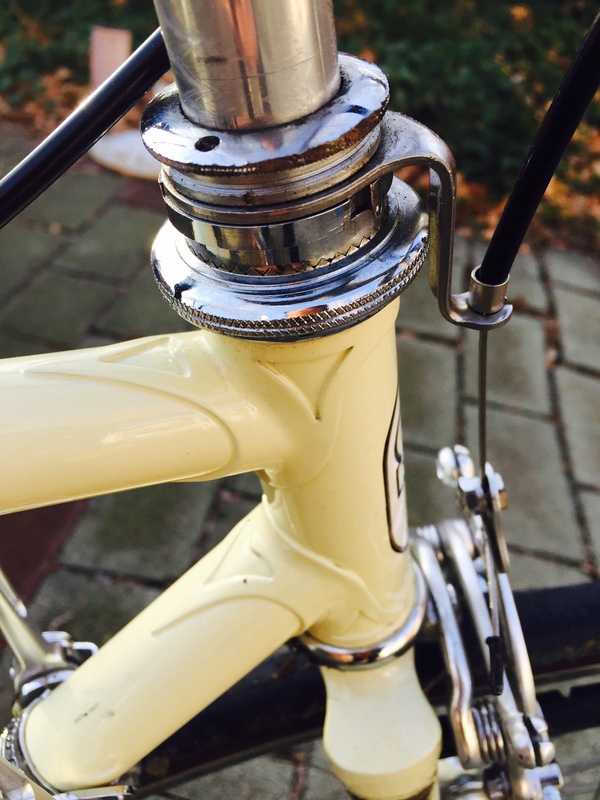 The Nitto stem and town bars were to ease the seating position for local runabout use. 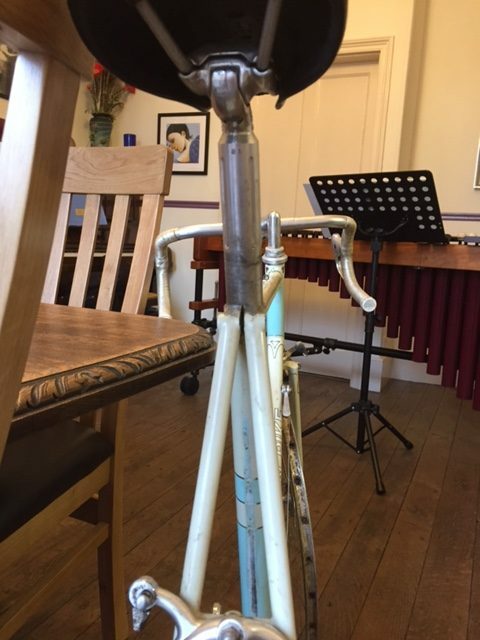 A better seat post and saddle, and a set of Conti 28mm Gatorskins. 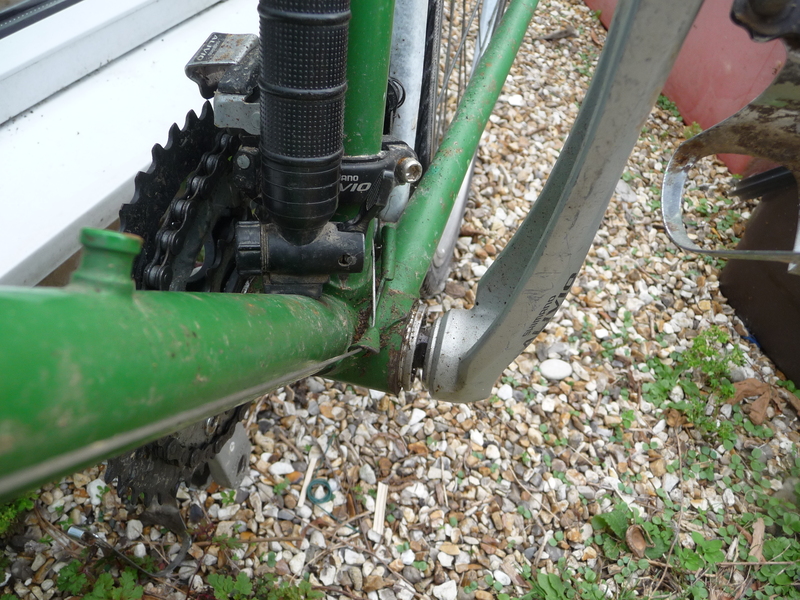 Changes to the freewheel were a six speed set and a new chain. I’m really happy with the solid ride and handling. I believe it to be a straight gauge tube set. 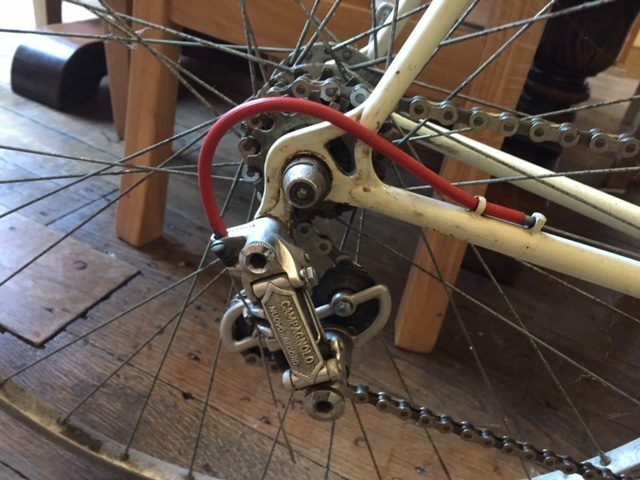 The component set is pretty sweet vintage Mafac, Huret, with TA crankset. 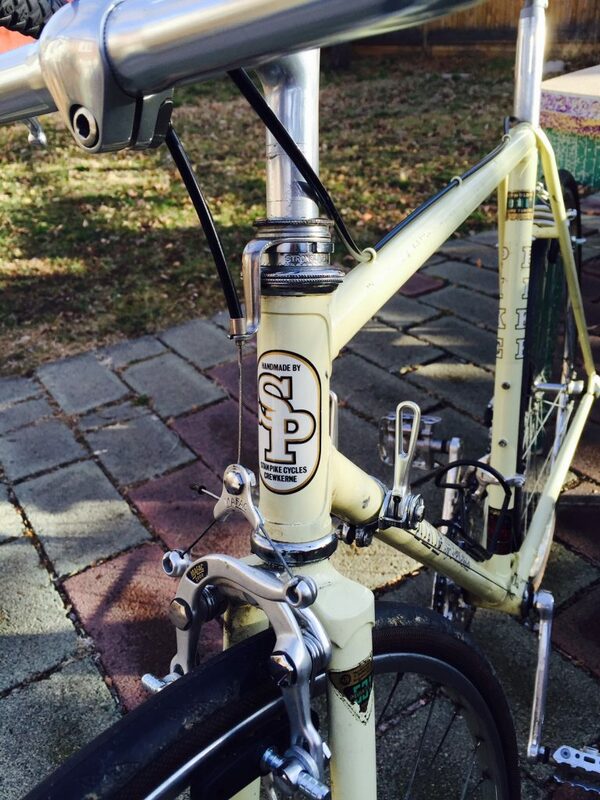 The bike gets compliments wherever I take it. 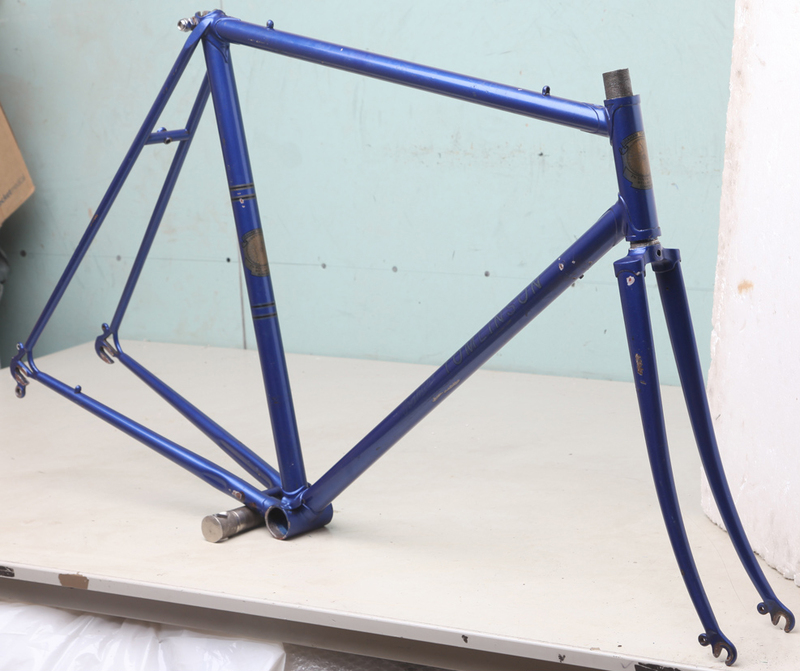 Yes, this is frame number PS 8201, there were five built in this number range during 1982, all were 531 plain gauge. This particular one is a 54cm when measured correctly with a 22 & 3/8” top tube. A nice example with clear benefit of a warm climate! 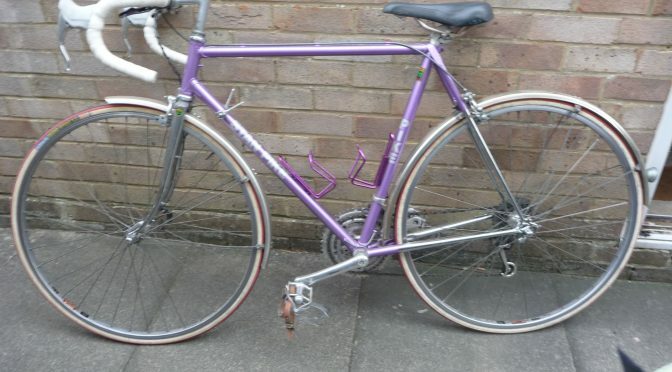 I have a Graham Tomlinson bike. 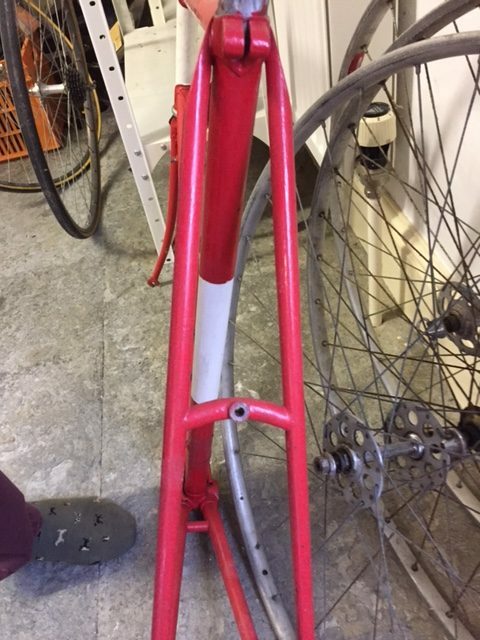 Any idea how I can tell who made the frame? 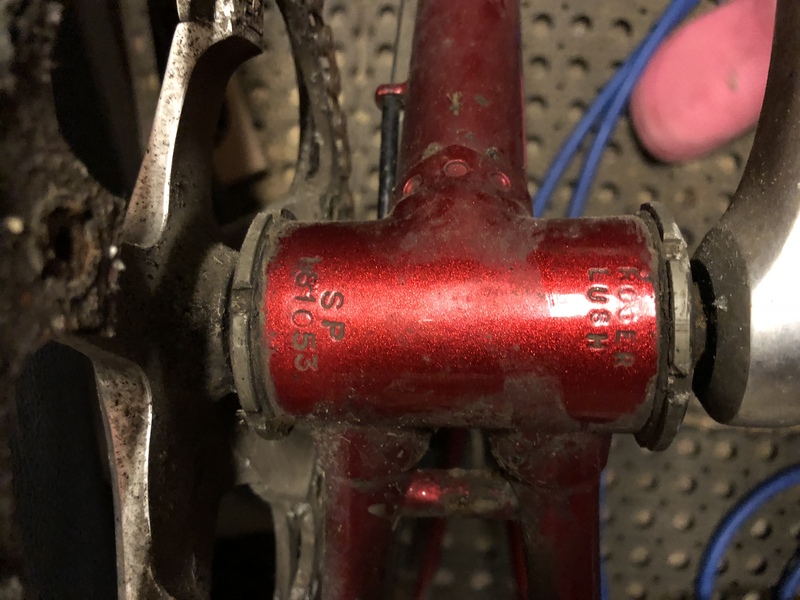 I found a number and some letters on the bottom bracket section. 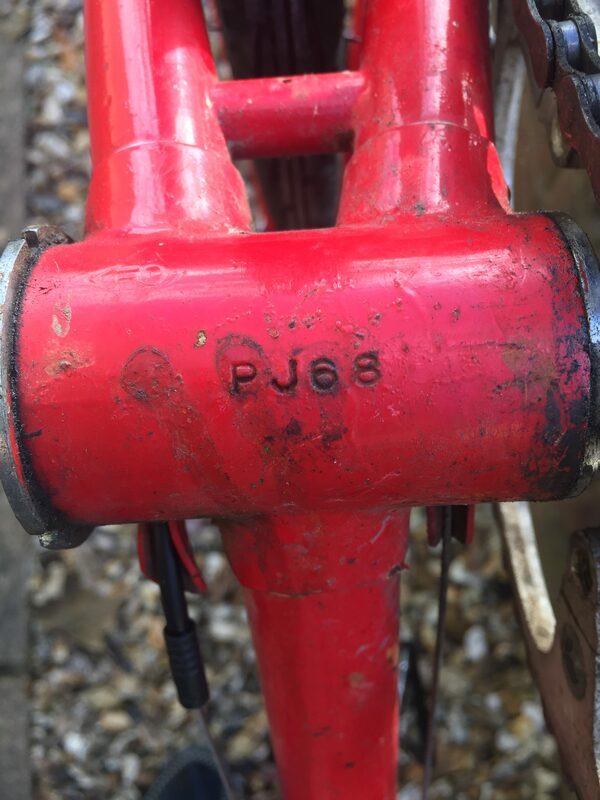 I had to scrape the paint to see it clearly it reads PJ 16. 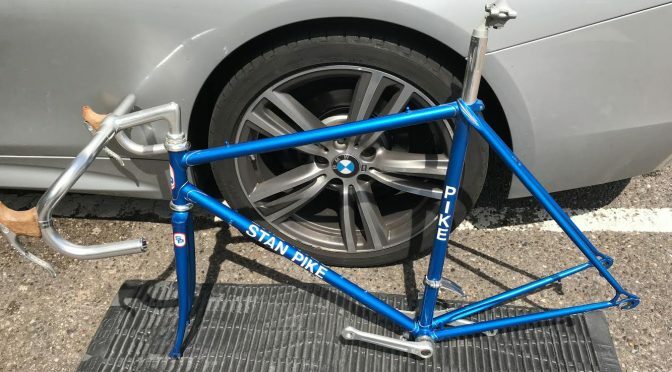 I am presuming this frame was built by Stan Pike’s son, Philip? Do you agree? 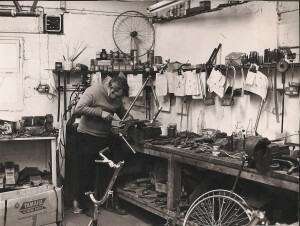 In the early 80’s Graham Tomlinson set up his own cycle shop (Graham Tomlinson Cycles) in Wellington, Somerset. 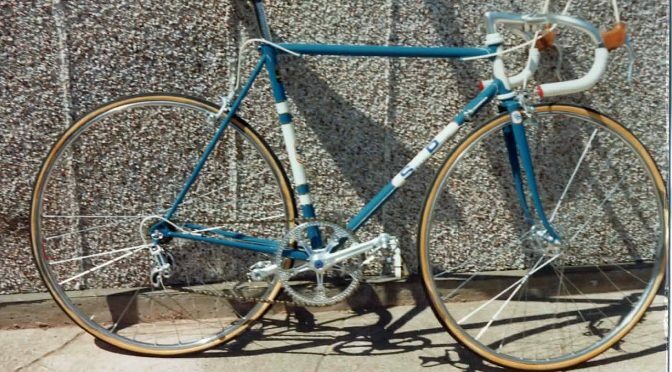 His first name branded frames were built by Stan and Phil Pike who taught Graham the art of frame building. Yes, it is one of ours. 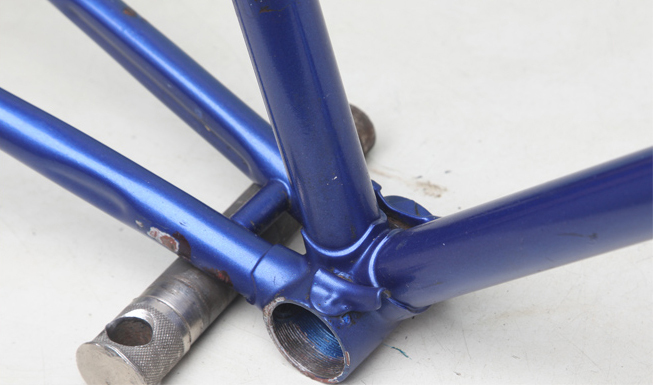 22 & 1/2″ frame built from 531 tubing. Was trying to figure the age and not too sure, but at a guess I’d say circa 1979/80. Wow! Great news! Thanks for your support researching this. 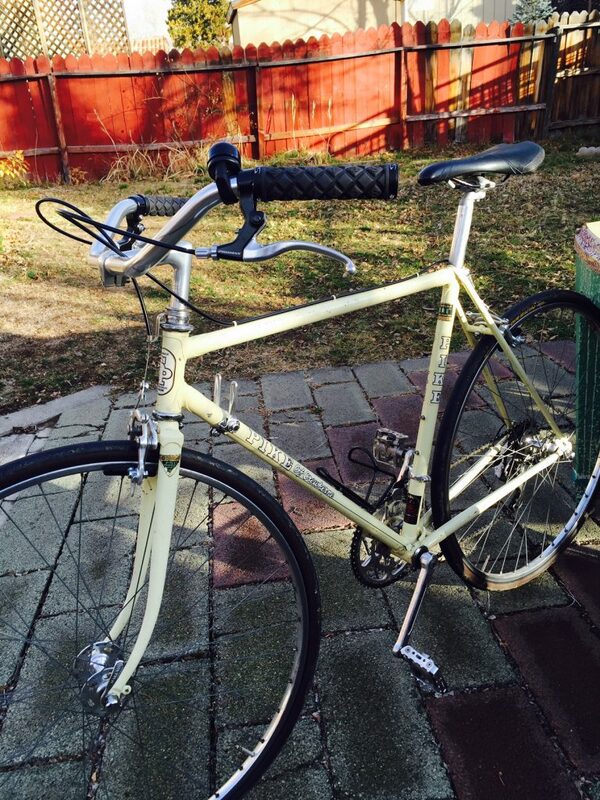 The bike frame is too small for me, which is a shame. I intend to sell it. I needed the wheels, which is why I bought it. 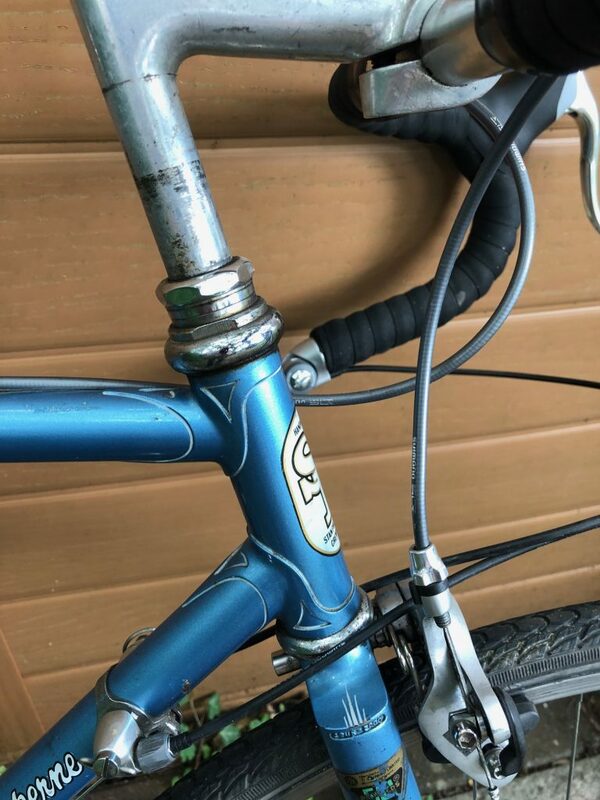 Giles sold the frame. 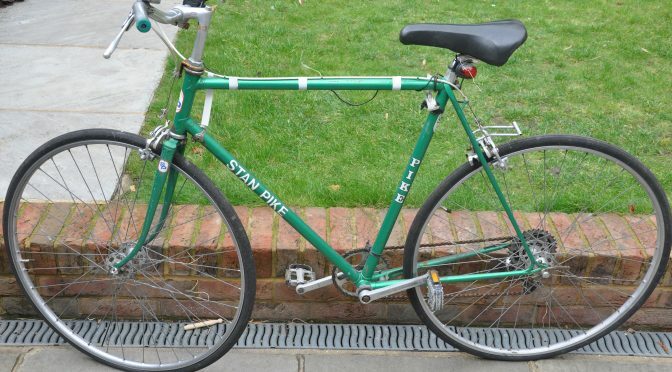 The next owner then sold it on to Hilary Stone where it’s available to buy for a very reasonable £195 – see here for further details (scroll halfway down the page). 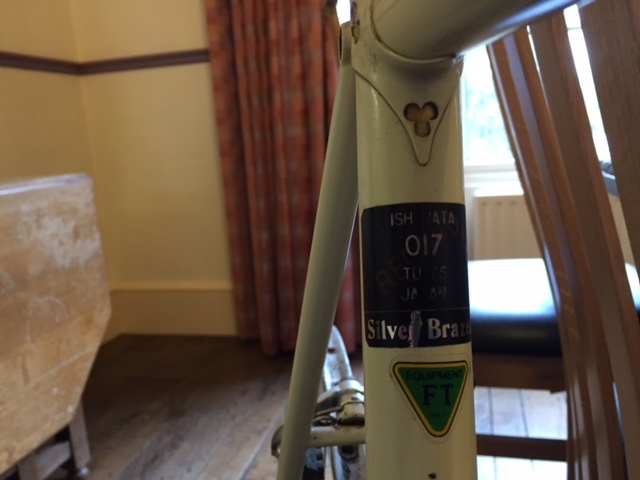 Graham Tomlinson’s wife has been in touch to say some decals for Tomlinson frames are still available. Get in touch through the contact form and I can forward your details to Graham. Thanks to Hilary Stone for allowing me to use the above photographs.